Did early focus on hard work make East Germans happier? The last few years, I have been reading a lot about happiness and how to lead a happier life. Perfectionism seems to be the enemy of good and of happiness. Rewarding hard work on the contrary seems to lead to more happiness. In East Germany, I remember, we got a grade for “Fleiß” which means “effort” or “hard work”. Automatically, when you tried to get a good grade for hard work it would correlate with a good grades in other subjects. So, I think linking hard work and grades was a pretty smart move of the Socialist education system. The grade for “Fleiß” is something that stuck with me for years and I remember it vividly. And as I look back at the past 10 years, going the extra mile almost always led to success. And maybe because of focusing on hard work in my life, I can consider myself a quite happy person. It’s been 25 years since I sat in our living room watching the unfathomable news that the Wall was open. I saw people standing on the wall, hammering parts off the wall, hugging each other, and feeling overjoyed. Finally, Reagan’s call “Tear down that Wall” came true. I was only 12 years old and led a quite comfortable and protected life. Yes, we did not have everything we wanted (e.g. bananas) but we had a good life after all. Now, everything was about to change. And I, as a child did not know how it would change. I felt confused and as if the world that I lived in came to an end. I did not fully understand what it all meant. Fast forward 25 years. Now, I live in the USA and the GDR/DDR seems so far away, just like a dream that I vaguely remember. I am so grateful however that the Wall came down and that I could have all the opportunities that I had. Opportunity to travel, to pursue the career that I wanted, to study abroad, and to move to the US. Ever since my relationship to institutions and my country has changed. I now understand that things can change very profoundly and instead of trying to hang on to the past, I try to maintain my personal freedom and my independent thinking. And the USA is a great place to be with that mindset. Nothing lasts forever. That is the biggest lesson that I learned from the Fall of the Berlin Wall. It is an important lesson. It helps me deal with change, adapt to new situations, and lessen my attachment to the past and present. “Tear down this wall!” At the time, I did not quite understand the significance of former US president Reagan’s words. In my childlike eyes, everything was going very well in East Germany. After all, we had a good life. But his speech also raised questions in my mind: Why is he asking the Soviets to open the gate? Why did we erect this wall? How would life be like without the wall? Reagan gave that speech on June, 12 1987 in front of the Brandenburg Gate. 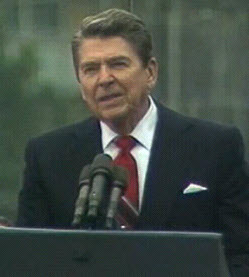 He addressed former Soviet leader General Secretary Gorbachev with his famous words “Tear down this wall!” Whether or not to use this sentence in the speech was controversial because it bore the risk of offending the Soviets and further increase tensions between the East and the West. Reagan decided to include the sentence. And with it, his speech made history. Some people doubt that Reagan’s speech had an actual impact on subsequent historical events. I personally believe, that his speech made a huge difference. It raised some very critical questions in the minds of the East Germans and gave hope to those opposing the totalitarian system. It brilliantly captured the zeitgeist and made America’s position and support for a unified Germany very clear. Until today, it remains an important milestone and event in the German history. Click here for the complete transcript of the speech. Learn more about the speech on Wikipedia. As in every country, music played an important role in East Germany. German classics were an important part of East and West German culture. Unlike the West, however, the East also used music to help internalize the socialist body of thought from a very young age. Ideology combined with music made socialism somewhat more fun and accessible to children. Most of the melodies were quite catchy and made the ideological message even stronger, more compelling, and stick better. In this post, I want to introduce a very popular song. So popular that Erich Honecker (former head of East Germany) even wanted this song to be played at his funeral. Its name is “The Little Trumpeter” (“Der kleine Trompeter”). Everyone in primary school had to learn this song by heart. The story is about a cheerful, good, and loved man, the Trumpeter, who is shot during a peaceful event. The song is very sad and one really feels like having lost someone very dear. The Little Trumpeter is based on a real story in which a member of the “Rote Frontkaempferbund” (paramilitary organization of the KPD, the German Communist Party) is shot by a policeman during a rally of the KPD in 1925. Von all unsern Kameraden, war keiner so lieb und gut, wie unser kleiner Trompeter, ein lustiges Rotgardistenblut. Wir saßen so fröhlich beisammen, in einer so stürmischen Nacht; mit seinen Freiheitsliedern, hat er uns so glücklich gemacht. Da kam eine feindliche Kugel, bei einem so fröhlichen Spiel, mit einem so seligen Lächeln, unser kleiner Trompeter, er fiel. Da nahmen wir Hacke und Spaten, und gruben ihm morgens ein Grab; Und die ihn am liebsten hatten, die senkten ihn stille hinab. Schlaf wohl, du kleiner Trompeter, wir waren dir alle so gut. Schlaf wohl du kleiner Trompeter, du lustiges Rotgardistenblut. Of all our comrades, nobody was as nice and as good, like our Little Trumpeter, a cheerful Red Guardsman’s blood. We sat so joyous together, in a so stormy night; with his songs of freedom, he made us happy. There came an inimical bullet, during a joyous game, with a blessedly smile, our Little Trumpeter, he fell. So we took hoe and spade, and dug him a grave in the morning; And those who loved him most lowered him silently. Sleep well, you Little Trumpeter, we were all so close to you. Sleep well you Little Trumpeter, you cheerful Red Guardsman’s blood. The change affected literally every area of my life, directly or indirectly. Over night, my whole world view ceased to exist. At the same instant, a new and overall better world was created. Socialism turned into democracy, centrally planned economy into market economy, Mark into Deutsche Mark, scarcity into abundance, grey landscapes into flourishing landscapes, constraints into new freedoms. Most things changed for the better but others for the worse. For example, job security turned into job uncertainty. In the former GDR (German Democratic Republic) almost everyone had a salaried job. When the wall came down, many businesses in our area shut down because they could not compete in a market economy. Unemployment skyrocketed. The day my mom lost her job was probably one of the most dramatic changes for our family during that time. She took several weeks (or even months) of training courses offered by the “Arbeitsamt” (German Employment Agency) to acquire new knowledge and skills which were essential to get back into a job. 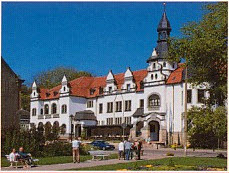 Eventually, she succeeded and was offered a job by a local spa/clinic, “Eisenmoorbad Bad Schmiedeberg” which remains one of the top employers in the region. The premises of her former company are now a parking lot for that spa. What meant the end for some businesses became the basis of growth for other businesses in our area. Other people were less lucky and had to leave their home towns to find a new job. Most of the people of my generation decided to migrate to bigger cities or abroad to find (better) opportunities. Hello my name is Joseph and I lived almost 14 years in Berlin. The first time in 1987, when the Wall was still standing. I lived in an “occupied” house (aka “squat”) in Kreuzberg, directly next to the Wall. When I looked out my bedroom window I would see the guard in the watchtower direct his binoculars at me. I must say, after a while, it became totally “normal” for me, that there be a wall dividing a city. How ideological can people get, anyway? Utterly fascinating! I can think of some funny stories, like when we moved out of one of our flats we found it easier to throw our old sofa over the Wall than to just leave it for the Staatreinigung (city sanitation). There was already enough trash in that neighborhood, so why not simply get a gang of guys together and make a statement, “Weg mit dem Scheißding” [Get rid of the f-ing thing]. I had moved to Berlin after having studied German in Munich. What a contrast between Kreuzberg and Munich! Crass!!! About 9 months later I returned to the U.S. and moved for 4 1/2 years to California. I’ll never forget that morning when the Wall “fell”: I came into work, and there was a 9-hour time difference between California and Germany. A German colleague came to me and asked, “Did you hear about the Berlin Wall?” And I countered, “No.” My curiosity was peaked. When he told me that the border points between East and West had been opened, and that there were people literally dancing on the Wall and partying in the streets, I at first looked at him like this was some sort of joke. Only after his serious convincing did I believe him, and promptly walked into my boss’s office and immediately requested vacation. I flew that evening with a flight on BA leaving just after work, and connected to Hamburg. When I arrived in Hamburg, we were surprised because that City was filled with “Ossis” (nickname for East Germans), too. But, we were more interested in driving to Berlin. I have a picture of me sitting on top of a car in front of the Reichstag when we finally arrived in Berlin. It was like one huge street party, and whole city gone crazy with utter joy. I stayed a few days and had to go back to work. “The Lives of Others” tells the story of a devoted Stasi (East German Secret Police) officer who is given the job to spy on a famous playwright and collect evidence about his disloyalty to the ruling Party. Being set between 1984 and 1991, the movie provides very realistic insights into the Stasi as well as the time before and after the fall of the Wall. I highly recommend this captivating thriller because it perfectly captures what I described in “Drivers for Change: Looking for Freedom” https://eastsides.wordpress.com/2010/03/24/drivers-for-change-looking-for-freedom/ (see “Freedom of Speech”). 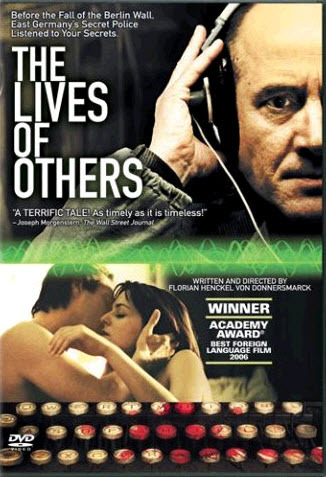 What happened in “The Lives of Others” on a higher level, happened everywhere in East Germany on all levels. One did not have to be a famous to fall victim to the Stasi.